Here is an important message regarding the dangerous tornado risk over the Southeast through Sunday. 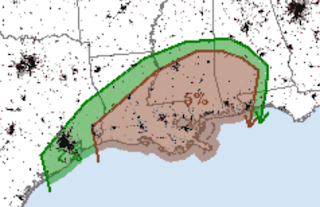 The brown, 5%, area has a significant risk of a tornado between now and sunrise Saturday. The significant threshold is 15% on this map. 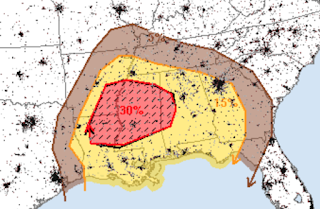 The hatched area is where very large hail may occur along with an elevated risk of tornadoes. Again, the significant threshold here is 15%. There seems to be a good chance of damaging winds and tornadoes. Later today, there is a slight chance of a tornado or two in coastal Southern California.